Call me crazy, but I always like getting a few pairs of socks for holiday gifts. No, not sock yarn, or handknits, just some regular old socks. Not exciting, but useful. Today’s gift idea is like that, mundane, but essential; Soak! Very nearly every project needs blocking, and a big part of that is using a good wool wash. In my eyes, Soak is the best. We have plenty of scents, but personally, I also go for ‘scentless’ – if you’re gift knitting, you never know who’s scent-sensitive, so I like to play it safe. Now we have a lot more options in store than are at the link above – unfortunately you’ll have to come in person or call us to find out exactly what’s on hand. 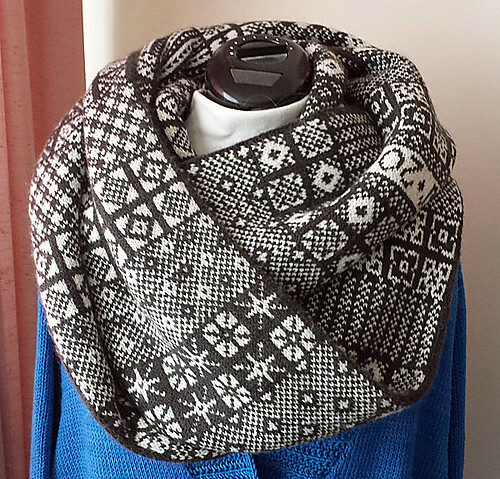 And today, I’m choosing to feature Wendy Johnson’s Sanquhar Cowl. I love the detailed colourwork, I reallllllly wish I could dig my needles into it right now, and the fair isle patterns are suitably holiday-ish. This entry was posted on Wednesday, December 3rd, 2014 at 11:01 pm	and is filed under Advent. You can follow any responses to this entry through the RSS 2.0 feed. Both comments and pings are currently closed.